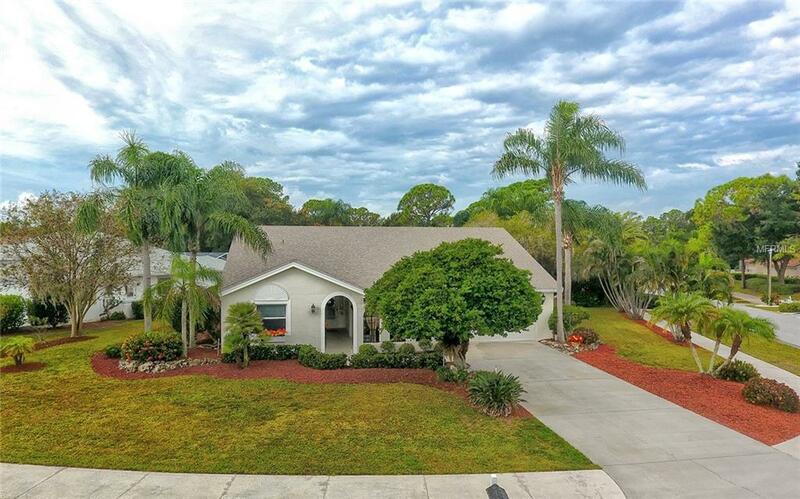 PRICE REDUCED~Here's a beauty for you in the Meadows, one of the most sought after communities in the Sarasota area. Truly a beautiful move in ready home with a New Roof in 2018, updated kitchen & baths, nothing needs done. It has an impressive curb appeal, as it's situated on a .30 acre corner lot with gorgeous mature landscaping. As you walk into the foyer, you are greeted with a vaulted ceiling and tons of natural light, as the whole back of the home has 2 expansive sets of sliding glass doors. The Kitchen has been fully updated with granite countertops, high end cabinetry with crown molding & lighting, built in wine rack & breakfast bar. There is a pass through to the dining room that has additional built in cabinets. The Master Bedroom also has sliders to the lanai, laminate flooring, a walk in closet & an ensuite bathroom. The oversized 3rd bedroom has approximately 300 sq feet & could be used as an in-law suite or a teenagers retreat. Lastly, is the incredible outdoor living space. The screened in lanai is 22 X 50 Ft with lots of sunning space & a great gazebo for shaded dining. The Meadows has various private CC memberships available with 3 golf courses, 17 har-tru tennis courts, Jr. Olympic pool, fitness center & 14 miles of walking/cycling trails. You will have the convenience of everything right out of your front door, from Shopping & Dining at UTC, Dining, it's right next to Nathan Benderson Park, minutes to SRQ Airport, Easy access to Downtown Sarasota & lets not forget our famous beaches!